Flare Blitz gets his health low enough for Zen mode while pounding down with STAB Damage. Flamethrower and Psychic being his hard hitting Zen Mode attacks, with HP Grass for coverage. * Daruma Mode is kinda lame, you need to mix attack and special attack but can only use one at a time (140 one stat vs 30 the other... no thanks). Sheer Force is great, and coupled with those items can probably OHKO everything it hits. It was the Japanese name for Flame Charge. A great sweeper, as long as it does not have Daruma Mode. Flare Blitz/Fire Punch: I say Fire Punch, as Encourage makes up for the lower base power. It isn't likely that you would have burned anyway. Nitro Charge does not raise speed by the way. Eartquake: Pretty much not affected by Encourage except for that power boost. Stone Edge: Critical hits are still unlikely, so just focus on the power boost. Return: Just gets a power boost, which is really nice. Let it hold a life orb cause encourage will stop the damage and im sorry I posted this now since this was 6 months ago. EDIT: Choice Scarf is a better item since it makes up for his lack of speed. Replace stone edge with rock slide, and return with u-turn. Although this is a great answer considering it was 7 months ago. Substitute: Provides a way to get in Daruma Mode. Hidden Power Grass: To deal with weaknesses. No, hammar arm lowers speed. Lowering a sweepers speed is getting rid of their whole purpose. You shoukd keep superpower. So it turns out that Daruma Mode swaps Attack and Special Attack, which makes it a bit more useful. He also gets a big defense boost. Should KO everything in its path. I don't think this will make it give it a Sp Attack increase. Flare Blitz is a strong Fire-type move and takes recoil that helps turn Zen Mode. Focus Blast is to take some Dark-types. Better you go attacking with Flare Blitz. If you and the oponent survive you may use Focus Blast. Flare Blitz is a strong move plus Sheer Force and Life Orb will be able to K.O. everything. Brick Break, Earthquake and Stone Edge is type coverage. EVs: 252 Atk / 252 Spd / 4 Sp. Def. With its Choice Scarf, it can outspeed a lot of stuff, and U-Turn helps scout out your opponent's moveset. With a lot of water moves being special, its Careful nature and 4 Sp. Def. EVs can help it survive a few of them. You shouldn't really use Flare Blitz a lot, as it eats away at Darmanitan's HP, but Rock Slide's power skyrockets when you pair it with its Sheer Force ability and 252 Atk EVs. Earthquake can help you dish out an easy OHKO to annoying Rock- Types like Gigalith or Golem (providing they don't have Sturdy). Solar Beam - Solar Beam covers Rock,Ground,And Water. I wanted to try this Pokemon with belly drum. This set is hard to use because of Darmanitan's awful defenses, but if used correctly is devistating. This guy is BEAST when its in its Zen mode form, so why not this set? Flare Blitz is used to deal very high damage and the recoil comes handy because of the Zen Mode ability. Flamethrower because of powerful stab and good accuracy. Essentially, this is a set catering to Darmanitan's Zen Mode. Use Flame Charge to raise your speed until you're changed into Zen Mode, then fire away with Psychic/Fire Blast at breakneck speeds! Use Rest if you want to change out of Zen Mode. I've used this set with success many times, and it always surprises people when I use Flame Charge/Rest! Ok. This is my first post so be gentle. I feel like its hidden ability is too unique to not use but its stats are all over the place. I came up with this set and it seems to work pretty well. Item: Bright powder/Lum Berry/Focus Sash/Life Orb. Suggestions? Substitute- great defensive move and helps get you into zen mode. Focus Punch- high power! Coverage and works very well with sub. The strat is pretty obvious, I think. Set up sub, use focus punch until you get into zen mode then go for special attacks. The EV spread will ensure that you go into zen mode after 2nd sub and the bulk will help you survive once in zen mode. I prefer Life Orb on this but if someone has a better suggestion, let me know. Thoughts? Sice Darmanitan is extremely overpowered in terms of attack but very weak at defense, I suggest lots of healing. Either I'm an amateur or someones hating me. Darmanitan has a very high physical attack stat, however his special attack is terrible; at base 30 it won't be doing any serious damage at all. 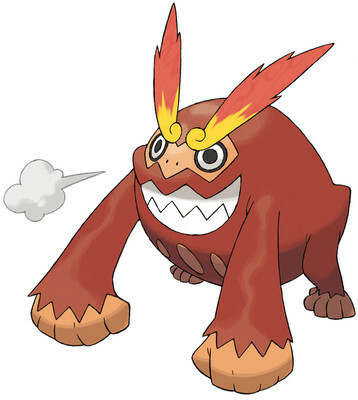 while both flare blitz and superpower are great and valid moves, solar beam is an ill-thought out choice for darmanitan, as not only would it take 2 turns to set up (unless in sunlight, which isn't stated in this build), it would be an extremely weak attack, due to solarbeam being a special attack. another note is that Darmanitan cannot learn recover at all, not even through breeding, so people reading this moveset would be left annoyed at that fact (although personally, if darmanitan could learn it then it would be amazing). darmanitan can however learn rest & sleep talk, which could possibly replace your recover & solarbeam yet still allow darmanitan to recover his health. If you ever want to make another moveset for a pokemon just quickly check the list of moves it can learn on the previous page so that what you write is valid and don't end up disappointing anyone.